I feel like this is going to be "Greek Week" for me. All I want to do is make and eat Greek food. I guess I associate this time of year with traveling abroad and going to local Greek festivals. 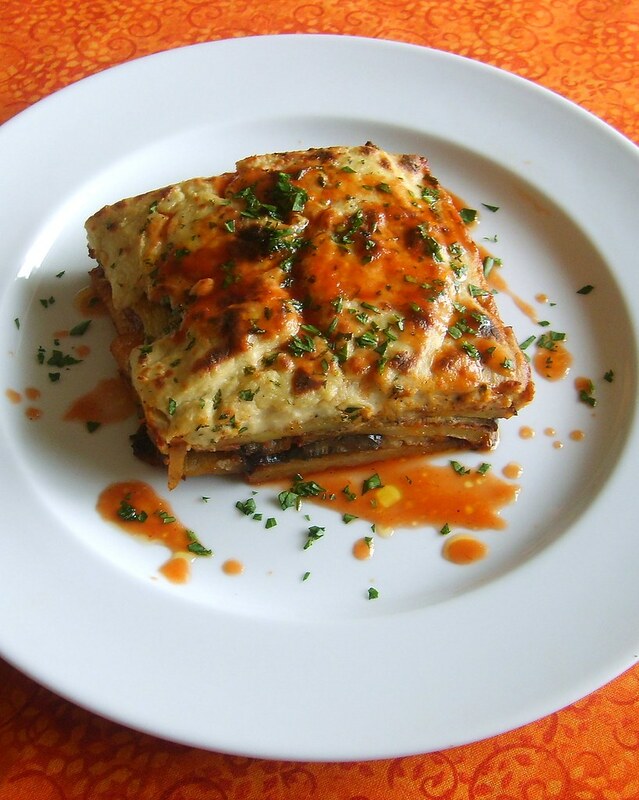 Most people think that Moussaka is prepared with ground meat, but for most households in Greece it is made with only vegetables such as eggplant, potatoes, zucchini and tomatoes. Actually, the word "Moussaka" refers to any casserole made with vegetables. The best vegetarian Moussaka that I ever ate was at a small outdoor cafe overlooking the caves of Matala, Crete. 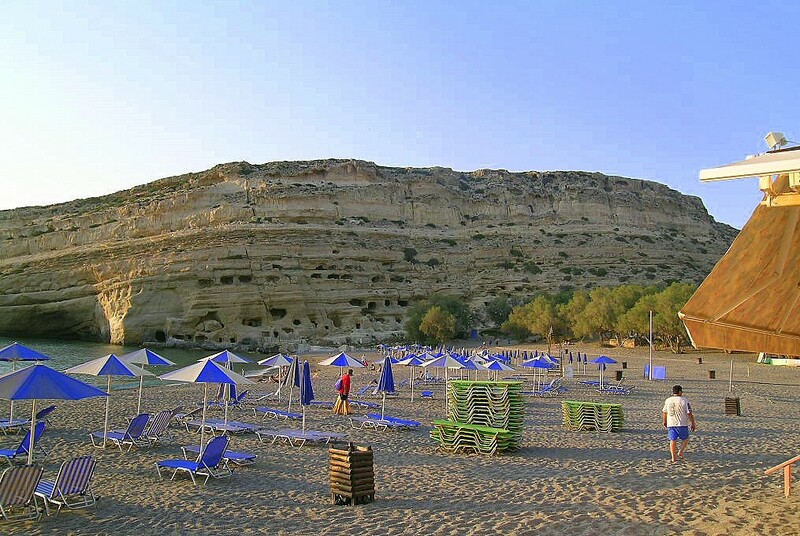 Matala is best known for all the hippies and "flower children" who flocked to the area and lived in the caves during the 1960's and 70's, until Crete declared the caves and the region a "protective area" in 1980. No one is certain why the caves were built, but current thinking is that they were used for Roman or early Christian tombs. I think that you'll really like this recipe for Moussaka. I know that the ingredient list looks long, but it takes no longer to make than regular lasagna. The creamy topping for Moussaka is traditionally made with a cream and cheese bechamel sauce, but my version is made with a cashew cream bechamel and you cannot tell the difference. It has a wonderful creamy texture, cheesy flavor, heightened with a hint of nutmeg and lemon juice. It's absolutely delicious and takes me back to Matala! Now I just need to work on getting a better view! Note: To save time, you can purchase your favorite marinara sauce, just make sure that you add the cinnamon to give it the authentic Moussaka flavor. In a medium sauce pan, saute onions and garlic in olive oil until soft. Add all the other ingredients, bring to a boil, reduce to a simmer and cook until thick and all the flavors have combined, about one hour. Place cashews in a bowl and cover completely with filtered water for at least 4 hours or longer. Drain water and place cashews in a blender and add two cups of fresh filtered water and blend until smooth, about 4 minutes depending on what type of blender you have. Strain cashew cream through a fine mesh strainer into another bowl and set aside. In a small sauce pan, saute onions, garlic and thyme until soft, about 7 minutes. Add a little water, if needed to keep the garlic from burning until onions are soft. Remove from heat and set aside. In a blender or food processor, add cashew cream, onion mixture, tofu and nutritional yeast and blend until smooth. In a small cup or bowl, mix together cornstarch and a 1/4 cup of water. Pour cashew mixture back into a sauce pan and and heat on medium-low and whisk in cornstarch mixture, nutmeg and the juice of 1-1/2 lemons, salt and pepper to taste. Continue stirring mixture until thick and bubbly. You want the mixture to be the consistency of loose mashed potatoes. Remove from heat, cover and set aside until ready to assemble. Brush two sheet trays lightly with olive oil and place eggplant slices, trying not to over lap. Brush the tops of the eggplant lightly with olive oil and sprinkle with salt and pepper. Roast eggplant for about 5-10 minutes until soft, depending on your oven. Since they are sliced very thin you want to make sure that you don't burn them. This is not to cook them all the way through, just to make them soft. Remove from oven and set aside. For the potatoes, you can either toss them olive oil and roast until soft, or pan fry on a griddle, which I did. I just brushed the griddle with a little olive oil, placed the potatoes so that they wouldn't overlap, sprinkled with salt and pepper and cooked on medium for about 5-10 minutes until soft. If you want to cut down on the oil, you can also steam or boil them. Set potatoes aside until ready to assemble. In a 10"x9" or similar size casserole dish, ladle about a 1/3 of the tomato sauce on the bottom. Layer with eggplant, potatoes, tomato sauce, repeat for the second layer, but for the third layer instead of tomato sauce for the top layer, pour on the cashew cream bechamel over the entire top and smooth with a spatula. Cover casserole dish with foil and bake for 40-45 minutes until bubbly. Remove casserole and preheat broiler to 500 degrees, remove foil and place casserole under the broiler for about five minutes for topping to brown. Remove from oven, cover with foil again and let sit for 10 minutes before cutting. Sprinkle with minced parsley and drizzle with extra tomato sauce or olive oil and a squeeze of fresh lemon juice.